Business can and should be done with a higher socially-beneficial purpose in mind, not just with a view to maximizing profits. A compelling sense of purpose creates a greater degree of engagement for all stakeholders and enhances organisational energy. Conscious businesses are explicitly managed for the simultaneous benefit of all their stakeholders, including customers, team members, investors, suppliers, communities and the environment. A conscious business aligns the interests of its stakeholders, seeking solutions to benefit all. Driven primarily by service to the organisation’s purpose and stakeholders rather than power or money, conscious leaders lead by mentoring, motivating, developing and inspiring people, not through commandand-control or the use of “carrot and stick” incentives. Research published in the book Firms of Endearment: How World Class Companies Profit from Passion and Purpose (Sisodia, Sheth, and Wolfe, Pearson Education 2014), found companies adhering to the principles of Conscious Capitalism outperformed the market financially over all measured time periods from 3 to 15 years. In addition to financial wealth these companies create many other kinds of societal wealth: fulfilled employees, happy and loyal customers, innovative and profitable suppliers, thriving and environmentally healthy communities and more. The Conscious Capitalism movement includes numerous CEOs and thought leaders globally. To fulfil its purpose and mission, and to respond to increasing demand for information, support and collaboration, Conscious Capitalism, Inc. empowers a global network of U.S. and International Chapters to run events and through presentations, publications and social media. The Australian Chapter currently has communities in Sydney, Melbourne, and Perth and in 2016 merged with New Zealand. 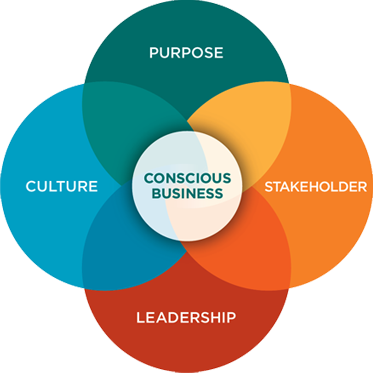 Conscious Capitalism Australia & New Zealand is a non-for-profit organization dedicated to the cultivation of the theory and practice of Conscious Capitalism and serving as communities of inquiry and practice for business leaders, entrepreneurs, coaches and consultants and others. Driven by members, for members, we aim to co-create a thriving ecosystem of conscious businesses that serve, lead and advocate the greater good. — Ed Freeman, originator of the Stakeholder Management Theory, trustee, Conscious Capitalism, Inc.
— John Mackey, co-founder & co-CEO, Whole Foods Market, trustee, Conscious Capitalism, Inc.
Join us at one of our upcoming events to learn about Conscious Capitalism and meet the community. — Kip Tindell, Chairman & CEO, The Container Store, trustee, Conscious Capitalism, Inc.